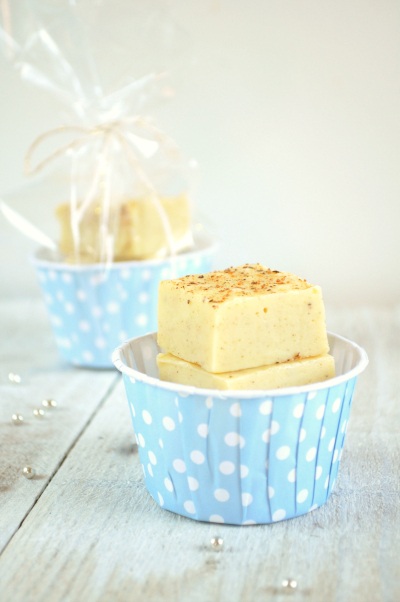 This fudge is spiked with booze and spices and makes a great Christmas treat. If you live somewhere warm like me right now I highly recommend you keep the fudge in the fridge or freezer. In this scene: Pale blue spotty cupcake cups, cello bags and gold striped twine. Grease and line a 20cm square cake tin with baking paper. Place the condensed milk, chocolate and brandy/sherry in a small saucepan over low heat. Stir continuously until melted and smooth. Remove from heat and stir in the spices. Pour into prepared tin. Sprinkle with extra nutmeg. Refrigerate until set. oOo The fudge also lasts really well in the freezer.